In order to keep my greedy and rather fussy tummy happy I have to have a day job. A day job which involves a reasonable amount of travel. Business travel is a funny old thing; I’m not silly enough to try, as many do, to claim that its all a big drag and terribly tiresome as it can be lots of fun but there are times when it is genuinely a bit of a pain. Travelling from airport to hotel in the dark then straight to an office to cram in as much work as possible before eating whatever late night food room service can offer (usually a dubious quality margherita pizza). That isn’t fun by anyone’s standards. Occasionally though there are a few golden hours that can be snatched and I’ve learnt that you need to make the most of them. of the top restaurants in the world. Despite its 2 Michelin star ranking, naysayers on the internet have mentioned that they do not believe service to be of standard but that absolutely wasn’t my experience. lunches and tourists and the atmosphere was light and airy and not overly stiff. The ceiling is covered in beautiful ceramic flowers and leaves making it quite feminine but very very classy. It is a family owned restaurant, chef Heinz Reitbauer stays behind the hobs whilst wife Brigit runs front of house and circulates chatting to everyone. Most restaurants make do with a bread tray but the in house bakery offering from Steirereck is so extensive that it requires a trolley. Over 12 different options were presented, in many cases still in whole loaves for fresh carving at the table. I tried three types in total including a honey and lavender loaf, a fennel and coriander Urleib and a bacon bread the latter fit to rival that of Pied a Terre which remains fixed in my mind some 5 years on. In essence; the bread is immense. Butter was presented in stripes on a slate as though it had been scraped on using one of those plastic tools that tilers use to apply grout behind bathroom tiles. Lemon salt ridges added another dimension to the home made butter. A translucent sliver of cured Austrian ham was served as a canape pegged onto an odd but innovative food “washing line” (look out for that line again later at petit four time…). 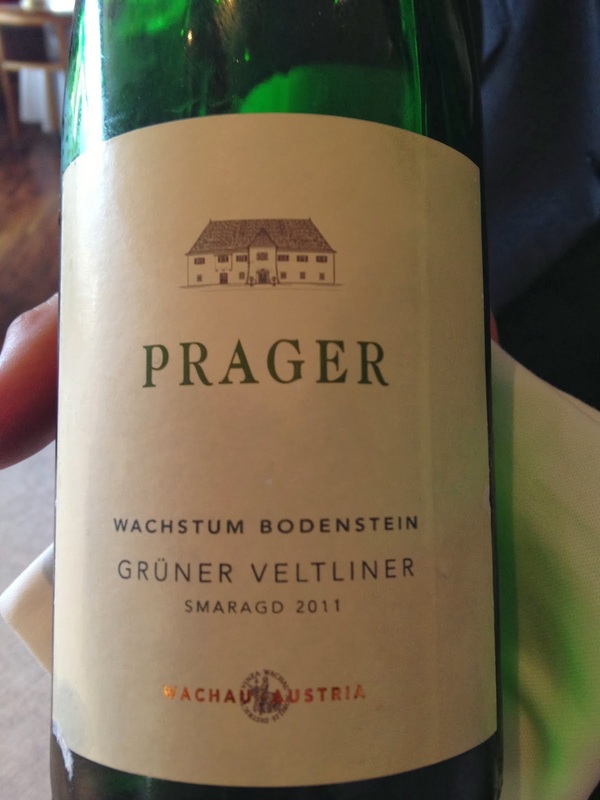 A Prager Gruner Veltiner was typically crisp and light with sharp green apples and faint tropicals on the palate. I had intended sticking to just two glasses of wine it being lunch on a work day with a meeting to head off to later in the afternoon but the sommelier had other ideas. Once we go chatting it was clear I needed a much broader introduction to Austrian wine whilst on their home turf and I suspect by the time I left the other diners viewed me as some level of functioning alcoholic from the number of glasses on my table. 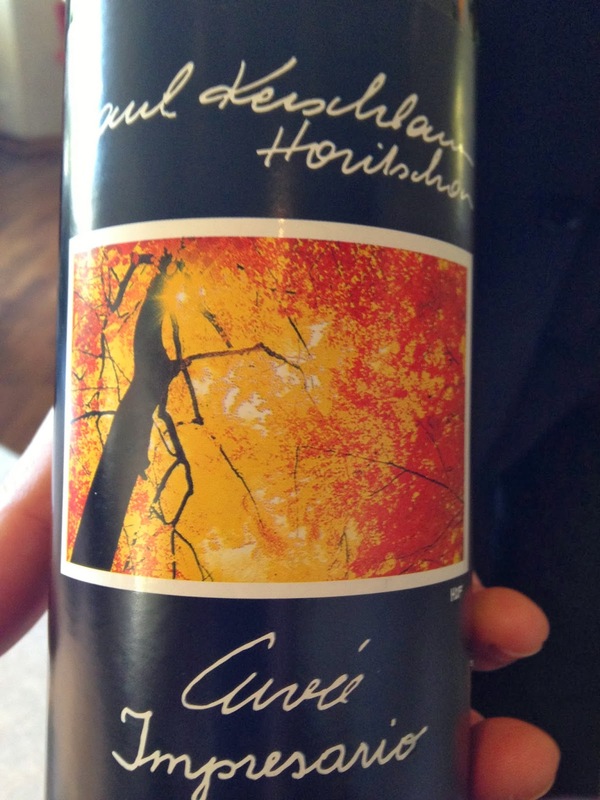 The Cuvee Impresario from Weingut Paul Kerschbaum felt like quite a Bordeaux style of red from the velvety, vibrant, cassis and almost cocoa and tobacco nose so I was very surprised to find out there was only 20% Merlot, the rest being made up of Zweigelt and Blaufrankisch. Another mystery wine turned out to be a 100% Blaufrankisch; full of pink peppercorns was light on intensity but high on cranberry fruit. A plate of cured wild boar’s head was spiced with cloves, cinnamon and pepper but completely avoided being too “Christmas spice” as it was balanced off against a sweet pineapple mustard with a kick blobbed amongst a raddichio salad dressed with galangal balsamic vinegar. Cubes of jellied grape juice added bursts of sweetness. It might all sound like a hotch potch of flavours and textures but it really worked. Not only did it taste divine but it looked like a miniature work of art. Crayfish with parsnip strudel & lime was the stand out dish of the meal. The strudel was actually a milk based gel wrapped around the parsnip puree. Spikes of parsnip crisp dotted along the top of the strudel added texture. The crayfish were beyond succulent and, whereas I plan on how I can recreate dishes I love at home, I know that I don’t have a chance of anything coming close to this. Candied lime segments and noilly prat helped cut through the creaminess and contrasted beautifully with the crayfish. The Wiener Schnitzel is surely a must when in this part of the world. It seemed a little incongruous with the two star dishes and service (kind of like having Shepherd’s pie at the Ledbury or something) but I wanted to experience it. Served very plain with just parsley buttered potatoes and a lemon wedge, the schnitzel was tender and moist. What surprised me most, however, was the outer crisp. I’ve always thought of schnitzel as being breaded and quite heavy but this was more like a fancy tempura version the outside of which would have remained a shell even without its meaty filling. One of the things that appealed to me most about the restaurant was the fact that it prides itself on providing classic Austrian cuisine to an exceptional standard so I felt like I was experiencing something truly local. Spoilt princess comment coming up, but sometimes restaurants that fit the “Michelin mould” can start to feel a bit same-same. You could be in London, Paris or New York and not really be able to identify which city you are in from the decor, the staff or the dishes. Steirereck is an exception to this; waitresses wear a semi- traditional “dirndl skirt” kind of outfit without being Sound of Music-esque and breads, wines and ingredients are all so very obviously Austrian. Dessert arrived in the form of a carre of rectangles of heavy chocolate ganache on a shortcrust base along side a pineapple tartare. Pineapple and pericorn sorbet was served aloft coconut macarons. All in all it was rather a pina colada style confection and very tasty but not quite up amongst the lofty heights of the crayfish dish or the boar’s head. 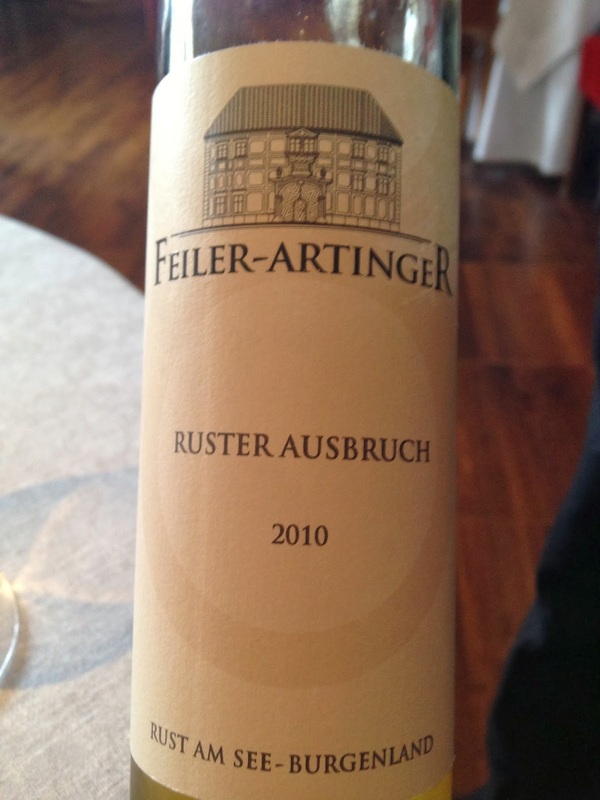 Feiler Artinger’s Ruster Ausbruch was an incredible wine. Made from noble rot grapes it is deliciously sweet with creamy lemon and honey notes with some dried apricot. In my opinion it can rival the finest noble rot wines I have ever tasted. To my dismay the sommelier confirmed that nowhere in Vienna stocks it to buy as it is sourced from the cellar door. The good news for Londoners however is that those clever people at Fortnum & Mason seem to have adopted it as one of their house dessert wines (here) where it comes in at about £27 for a half bottle. The “washing line” returned as a display line for various little sweets, the most interesting being a pink jelly envelope filled ravioli style with fruit puree. If you like this style of dining and you are going to Vienna please, please visit Steirereck, I promise that you won’t regret it. Downstairs on the ground floor is the more casual Meirerei (or “dairy”) which is still rather on the swish side with white gloss tables and neon light art. Serving traditional Austrian and Viennese dishes but specialising in local cheese and milk based drinks. For less than £10 each you can get a large glass of decent local wine and a platter of cheese, each labelled and accompanied by a recommended order of eating. Most were delicious but unfortunately I’d have to counsel against the primeval ooze known as ‘Vorarlberger Sauerkase‘ for all but those with the strongest of constitutions. I can merrily eat Stinking Bishop but this stuff made it look like Dairylea strength wise. I tried drinking wine, gulping water, eating crackers but nothing was going to remove the feeling that I had eaten a fetid rat corpse. Other much more positive cheese highlights included Bachensteiner (a soft cows cheese in the Alsacien style washed in brine and sometimes in wine- often available from La Fromagerie), and Osterkrohn (a strong blue but creamy hard cheese). A really good selection of Austrian wine is served by the glass or in little flights so its a good place to get an introduction to real local specialties. So if you’re looking for a glass of wine or a snack during a walk through the Stadtpark then I would definitely recommend Meirerei, it also has an outside platform which is gorgeous when the sun is dappling through the trees. I've ALWAYS wanted to go here!! I love Vienna and came within a whisker of trying Steiereck out a couple of years ago! It is definitely sitting in my top 5 restaurants of all time- if you're back in Vienna, please, please do go!